Wayne has Type 2 diabetes for a couple years now and constantly has to check his blood sugar levels. He is very forgetful at times and he constantly needs to be reminded by his wife Martha to check his blood levels and take his medicine, especially when at work. She sometimes needs to call Wayne 5 to 10 times a day and remind him. One time Wayne had forgot completely to check his blood sugar levels and his wife, for some apparent reason, could not get in touch with him. Wayne got dreadfully sick and had to stay in the hospital for several days. When Wayne had to return to work the following week his wife Martha had the greatest idea for him not forget to check his blood levels and take his medicine. When Wayne walked into work that first day, he was covered in yellow sticky notes from head to toe. As he greeted one of his coworker’s, he said “Please don’t mind the sticky notes. 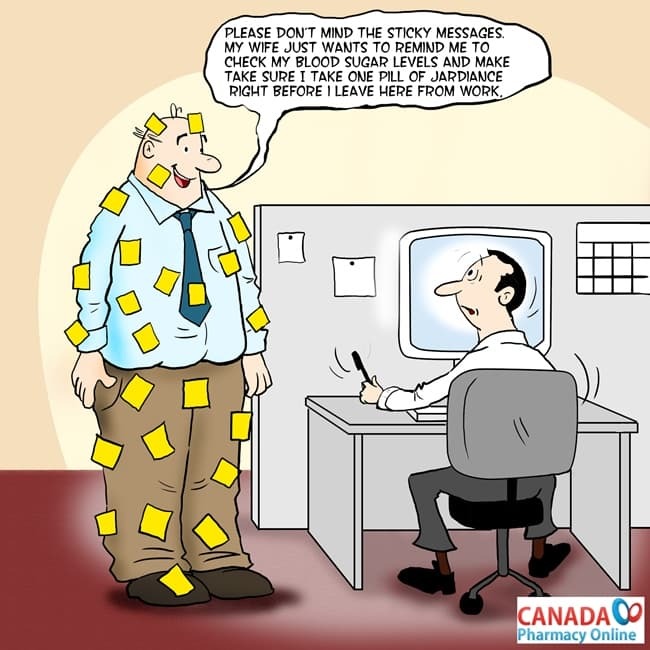 My wife just wants to remind me to check my blood sugar levels and make sure I take one pill of Jardiance right before I leave here from work.” His coworker just looked at him with an expression of shock and disbelief as he just continued to work at his desk.